Ashton Goddard was named player of the game for his four shutout innings in picking up the win against Godinez at Skipper Carrillo Field on Thursday, April 2. 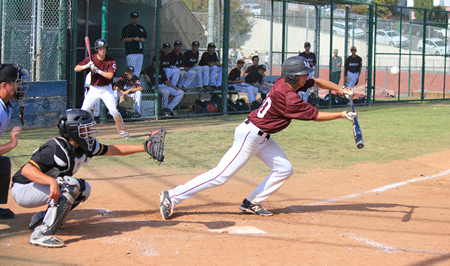 Anthony Norelli lays down a bunt single against Godinez at Skipper Carrillo Field on Thursday, April 2. Laguna won the game 16-0. Photos by Robert Campbell. Ashton Goddard pitched four no-hit innings and relievers John Ogden and Jack Loechner gave up only a hit each to seal a 16-0 Laguna victory last Thursday, April 2, at Skipper Carrillo Field. The Breakers had seven doubles in their 16 hits showing no problems in taming the Grizzlies (4-10, 3-2). Breakers lead the all-time series 18-1 and extended their Orange Coast League win streak to 39 games, fifth longest in CIF history. Jack Simon and Anthony Norelli led the seventh inning comeback for Laguna while pitcher Ashton Goddard finished the last two innings in relief for the win over the Warriors (6-9). It was Laguna’s first win over Woodbridge since 1990. Breakers took a 2-0 in the first inning only to have Woodbridge to come back twice to take leads of 4-2 in the third inning and 8-7 in the sixth inning. Breakers had 12 hits in the contest led by Zak Kovacic with three hits and three runs. 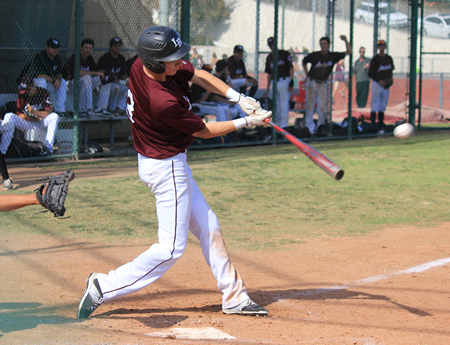 Jake Smith connects for a double in the Breaker’s win over Godinez at Skipper Carrillo Field on Thursday, April 2. 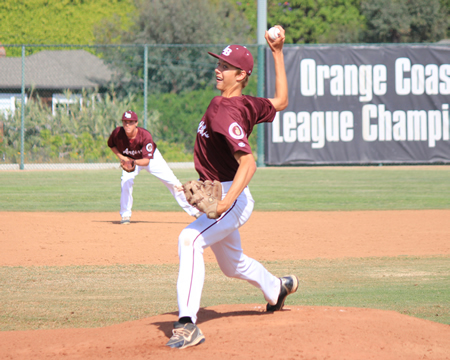 The D-I Vikings (9-9) snapped Laguna’s seven game win streak as Jared Harmon pitched a one-hitter this past Tuesday, April 7, at Irvine High School. Blake Burzell pitched four and 2/3 innings giving up only one run in the first inning before the roof fell in and Marina scored three runs off five straight hits. Marina added two more scores in the sixth for the victory. Up Next: Breakers played in the tournament playoffs this past Wednesday and Thursday and will play El Modena at Anaheim Stadium on Tuesday, April 14 at 3:30 p.m. League play resumes at home on Wednesday, April 15, for the 100th all-time meeting with Costa Mesa.